Under guidance from our Doctor, David Candler, Skin Alert uses a revolutionary system combining vacuum suction and broad spectrum light to reduce acne without the need for antibiotics or other prescription medication. This device, widely used by dermatologists, safely and effectively reduces acne lesions and their associated redness with minimal to no downtime. We customise your TheraClear™ treatment with deep cleansing, exfoliation, extractions and specialty masks to enhance your overall result. On average a course of treatments spaced at 1- 2 week intervals will produce a 90% success rate. We have had many happy clients, for some of whom nothing has worked before. Treatments are reasonably comfortable, quick to perform, and highly effective. Acne is a multi-factorial medical condition with many causes that affects teenagers and adults. It is strongly associated with excess sebum that combines with proliferating dead skin cells to block pores. The resulting lesions (blackheads, whiteheads, pimples, pustules and cysts) can be uncomfortable, and have a negative impact on a person’s happiness and confidence. We can now effectively and comfortably treat all forms of acne without medication, antibiotics or harsh products, instead using the TheraClear™ system. During this course of treatments we recommend adhering to a skincare regime to maximise results. The Doctor and/ or Dermal Therapist will advise products that actively target acne. Patients will also be given advice on dietary and lifestyle factors. What is TheraClear™ and how does it work? TheraClear™ is a state-of-the-art two part system that tackles acne head on to visibly reduce inflamed lesions. Firstly vacuum deep cleanses the pores, extracting blocked oily matter. Broadband light then targets molecules called porphryns to destroy P. acne bacteria and reduce oil production, redness and pigmentary changes associated with acne. This combination of reducing sebum + unclogging the pores + targeting the P. acne bacteria is why TheraClear™ is so effective. Anyone with active, persistent acne is an ideal candidate for TheraClear™ treatment. Inflamed lesions like pimples and pustules respond especially well because the treatment will also reduce the accompanying redness. We can treat all ages and all skin types. For acne scarring treatment, we have other modalities like laser and IPL, skin needling, peels and microdermabrasion. Sessions may take up to an hour, because we customise TheraClear™ treatments to incorporate deep cleansing, exfoliation, extractions, masks or LED to maximize results. 4-6 treatments at weekly or fortnightly intervals are recommended. Improvements are usually modest for the first two sessions. The third treatment seems to produce the most significant improvement and after the fourth and fifth treatment, most if not all the acne lesions should be flattening and fading. Maintenance sessions every three to four months may be required for long lasting results. Any face or body area with active acne lesions can be treated. While the TheraClear™ machine is operating there can be a sensation of quick flicks of a rubber band when the light pulses into the skin. There is minimal downtime but some patients will have varying degrees of redness that fades over a few hours. Face $180 per session, packages available. Under 16s Face $150 per session, packages available. Other body areas POA. 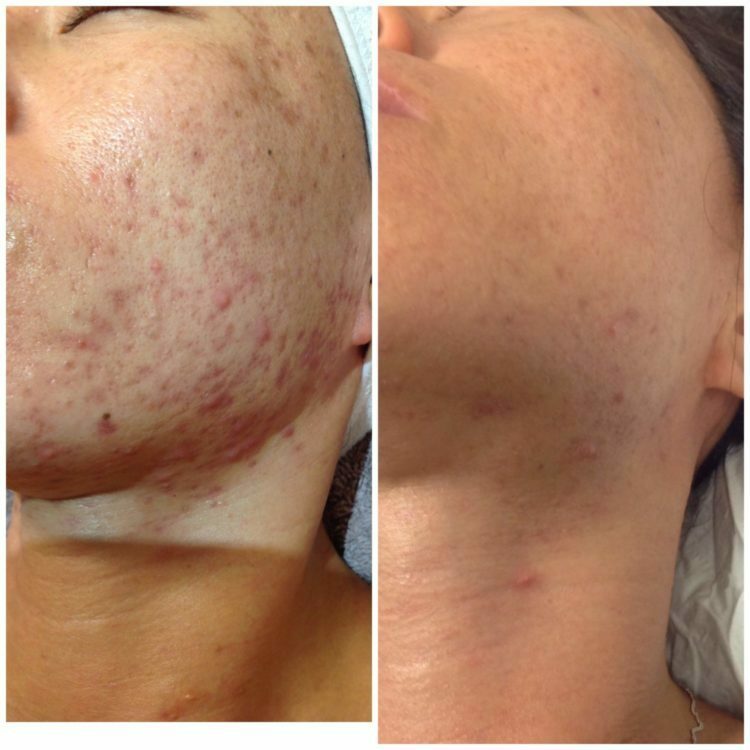 If you are not a suitable candidate for TheraClear™, here at Skin Alert we have many other modalities that successfully treat and manage acne, including laser, peels, and LED. In some cases you may be given a treatment plan that incorporates more than one treatment modality. If you are interested in safe, effective acne treatment, please call us for more information. We have multiple lasers that can treat acne. Depending on the type of acne present will depend on what laser is used. For inflamed, pustular acne we use our Nd:YAG laser. These lasers help to reduce the pimples and pustules associated with acne as well as reduce oil flow. Multiple treatments are necessary every 1-2 weeks. Most face and body areas can be treated. For non-inflamed, congested acne (blackheads and bumps under the skin), we use our erbium YAG laser. The laser beam passes over the skin, lightly ablating away fine layers off the surface. This removal of surface dead skin allows for the congestion to come through and be removed. Multiple treatments may be necessary. All face and body areas can be treated. Certain peels are known to be effective in the treatment and management of acne. Depending on the form of acne present, a course of salicylic acid-based, vitamin A or TCA peels may be recommended. Salicylic acid helps to remove excess oils and clear clogged pores. Vitamin A helps to regulate the skin's oil flow and cell turnover, and TCA peels assist in clearing clogs from the skin, leading to improvements in acne. Blue LED light is known to be beneficial in the treatment of acne. Blue light helps to kill harmful bacteria that are associated with acne. Red LED light supports the skin to heal better and so is often used in conjunction with blue light. Multiple treatments are necessary, twice a week. We may combine LED with other modalities to treat acne.